Action from Welbeck v Caythorpe. For the first time this season, a full slate of Nottinghamshire Premier League results was achieved, all games being completed in their allotted times and Welbeck returning to the top of the table on Saturday. They played host to previous table-toppers, Caythorpe, and relieved them of their unbeaten status with a 54-run victory. Kimberley's George Bacon bowls at Ordsal Bridon's Paul VD Heuvel. 'Picture by Dan Westwell. After winning the toss and batting, the home side owed their total of 188-6 to a pair of stands of over 50. Matthew Higgins added 64 with Andrew Parkin-Coates (32) for the second wicket and then a further 55 with Richard Stroh for the third. Higgins was out for 67, Stroh finishing 47 not out and Mathew Dowman took 3-42 to help restrict the score. Tom Lungley destroyed Caythorpe’s reply before it could get started. He took four of the first five wickets as the Acorns found themselves 22-5. Dowman did his best to stem the tide, but with no one able to hang around for any significant time, found himself marooned on 58 as the innings ended on 134, Lungley finishing with 5-28 to complete a second five wicket haul of the season. Ordsall Bridon hit the heady heights of third after they took the majority of the points from a draw at Kimberley. The Institute won the toss and invited their guests to bat in a match reduced to 46 overs per side. 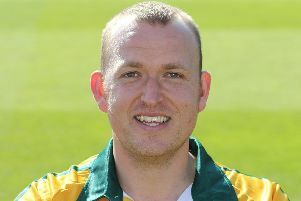 Martyn Long (37) provided an 85-run base with skipper Paul van den Heuvel, from which the side went on to total 204-8. Van den Heuvel, who was sixth out for 75, top-scored and Alex King claimed 5-60 to limit the damage. After Sam Johnson fell to his first ball, Shaun Levy and Tom Rowe took Kimberley to 90 before Rowe was run out on 65. From there, wickets fell regularly until Chris Glover was left to play out the final over in a nervy finish to secure the draw, Aqab Ahmed’s 4-56 not enough to lead his side to the win. At the Village Green, newly promoted Attenborough hosted champions Cuckney, who won the toss and had their hosts bat. Alec McKinley continued his rich vein of form, once again leading the way for his side, adding 53 with Matt Cross as the score moved to 92-2. When he finally fell for 91, the score had moved on to 169-7. Ben Bhabra (31) and Dominic Harvey (30) provided a healthy 62 further runs to close out Attenborough’s innings on 231-7. Luke Thomas was the pick of the seven bowlers used, taking 3-27. Cuckney found themselves in a spot of early trouble at 14-2, before James Hawley (38) and Nick Langford (55) added 70 for the third wicket. From there, though, the Attenborough bowling tightened and, with wickets falling, Cuckney found themselves hanging on for the draw as their overs ran out with the score 146-9. Dominic Harvey took 3-10 from his 11 overs and Muhammad Usman 3-33 as the draw saw Attenborough into fourth in the table. At Birchover Park, the West Indian Cavaliers lifted themselves into the mid-table pack with a five wicket win over Farnsfield. After winning the toss, the home side invited their guests to bat. Farnsfield’s total of 174 all out was built around Sam Wood’s 66, but a couple of run outs and three wickets for Kafeel Shafique kept them pegged back. The Cavs found themselves in trouble as Jamie Wagstaff (3-61) reduced them to 30-4 in a devastating opening spell. Home skipper Bilal Shafayat was the central figure in the recovery, adding 86 with Aqib Afzaal and 60 with Dominic Williamson to secure the victory, making use of one of the unused balls from the Farnsfield innings to do so, Shafayat closing unbeaten on 75. Starting the day in second, the Notts Academy would have been in confident mood ahead of their trip to Plumtree. After losing the toss and being reduced to 24-4 after being asked to bat, that confidence may have evaporated. Despite a mini-recovery in the middle of the innings, Bobby Gamble’s 6-19 from 14.4 overs broke the back of the innings and saw the Academy finish on 99 all out. Plumtree’s reply wasn’t smooth, and but for a steady 42 from Hassan Azad may have been even more nervy, but they made the target in the 29th over for the loss of five wickets. Clifton Village lifted themselves into second spot with a rapid eight wicket win at Radcliffe-on-Trent. The visitors won the toss and invited their hosts to bat, and after a steady start, the introduction of Aitizaz Khan into the attack precipitated a steady stream of wickets, Radcliffe losing 4-11 and later 6-29 as they struggled to 100 all out from 40 overs. Wasim Rana top-scored with 22, while Khan took 4-40 and Adam Shepherd 3-14. Clifton’s reply took just 19 overs as Greg Smith hit an unbeaten 69 from 71 balls to lead the chase as the Villagers totalled 105-2 to claim all 20 points and deny Radcliffe even one bonus point. At The Village Green: ATTENBOROUGH (18) 231-7 (A. McKinlay 91, B. Bhabra 31*, D. Harvey 30*; L Thomas 3-27) drew with CUCKNEY (5) 146-9 (N. Langford 55, J. Hawley 38; D. Harvey 3-10, M. Usman 3-33). At Kimberley: ORDSALL BRIDON (17) 204-8 (P. Van Den Heuvel 75, M. Long 37; A. King 5-60) drew with KIMBERLEY (8) 187-9 (T. Rowe 65; A Ahmed 4-56). At Plumtree: NOTTS ACADEMY (2) 99 (B. Gamble 6-19) lost to PLUMTREE (20) 102-5 (H. Azad 42) by five wickets. At Radcliffe: RADCLIFFE (0) 100 (Atitaz Khan 4-40, A. Shepherd 3-14) lost to CLIFTON (20) 105-2 (G. Smith 69*) by eight wickets. At John Fretwell Sports Complex: WELBECK (20) 188-6 (M. Higgins 67, R. Stroh 47*, A. Parkin-Coates 32; M. Dowman 3-42) beat CAYTHORPE (2) 134 (M. Dowman 58*; T. Lungley 5-28) by 54 runs. At Birchover Park: FARNSFIELD (3) 174 (S. Wood 66; K. Shafique 3-37) lost to WEST INDIAN CAVALIERS (20) 176-5 (B. Shafayat 75*; J. Wagstaff 3-61) by five wickets. SATURDAY - Nottinghamshire Cricket Board Academy v Attenborough, Kimberley Institute v Plumtree, Clifton Village v West Indian Cavaliers, Caythorpe v Radcliffe-on-Trent, Welbeck v Cuckney, Ordsall Bridon v Farnsfield.